If the Russians are to be believed, vodka is definitively Russian. After all, movies, advertisements, and even news articles all point to vodka as a distinctly Russian product. However, the truth about who invented vodka is far more contentious than most drinkers realize. The provenance of the clear, odorless, flavor-neutral spirit is claimed by both Poland and Russia, but vodka’s history can be traced far beyond Eastern Europe. Russia’s semi-official news agency RT traces Russian vodka back to the 1440s. In the cold, harsh climate of Russia, producing grapes for wine was not feasible. As such, Russian distillers instead turned to fermented grains. The hearty Russians invented a grain-based alcoholic beverage, originally known as bread wine. It was produced through a careful pot distillation process, making it Russia’s first true vodka. This bread wine was first distilled in a Muscovite Monastery, and by the 1440s made its way to Moscow proper. That’s the Russian account of things. According to many Poles however, vodka originated in Poland far earlier. Poland’s claim to vodka traces its origins to the world’s first written reference to vodka in 1405. A few decades later, Polish vodka was infused with medicinal herbs, giving birth to Poland’s national vodka, Zubrowka. Informally known as bison grass vodka, Zubrowka is distilled from rye and then infused with bison grass from the Białowieża Forest. Due to the primeval forest’s protected status as a UNESCO World Heritage Site, only 21 families are authorized to harvest the grass, dry it on the roofs of their houses, and sell it to distilleries. The rye vodka is infused with the grass, giving the vodka a smooth almond, herbal, and caramel taste. Before bottling, a single strand of handpicked bison grass is inserted into the bottle. Tragically for the American consumer, this strand of grass contains trace amounts of a chemical called coumarin, a compound that prohibits its sale in the United States. However, using other native plants, a faux-bison grass vodka is sold in the United States under the name Zu. If you’re not interested in buying faux Zubrowka, you can make your own. Buy any grain-based vodka (the Polish Sobieski works well), and buy sweetgrass braid here. One inch of sweetgrass braid in a 750 m. bottle of vodka will infuse and be service-ready in about eight hours. You can either strain the grass out or leave it in for a more intense flavor [Ed. note: it’s our opinion that this method is the better of the two options]. It would appear then that the debate is settled. Poland’s claim predates Russia’s by at least 40 years. However, no debate is ever fully settled, and the origins of distillation go back further still. The process of distillation refers to increasing the potency of an alcoholic beverage by evaporating alcohol and then allowing it to re-condense into a higher-proof liquid. Modern distilling relies on either the pot still or the continuous (column) still. Pot stills heat a fermented mash to a temperature between the boiling point of water and alcohol. The alcohol evaporates away, and travels through a pipe to a cooler container, where it condenses. The other modern still is the continuous still, which relies on perforated plates and steam pressure to separate the alcohol from the water. In ancient times, distilling was a much cruder process. Simple pot stills used heat to separate the materials, but another method, the Mongolian still (also known as freeze distillation), relied on the different freezing points of alcohol and water. The mash was frozen, and since the water would freeze out before the alcohol, the ice could be removed from the mash. Neither method was precise in the era before thermometers or germ theory, nor was it uncommon to produce poisonous concoctions that had more in common with industrial byproducts than vodka. 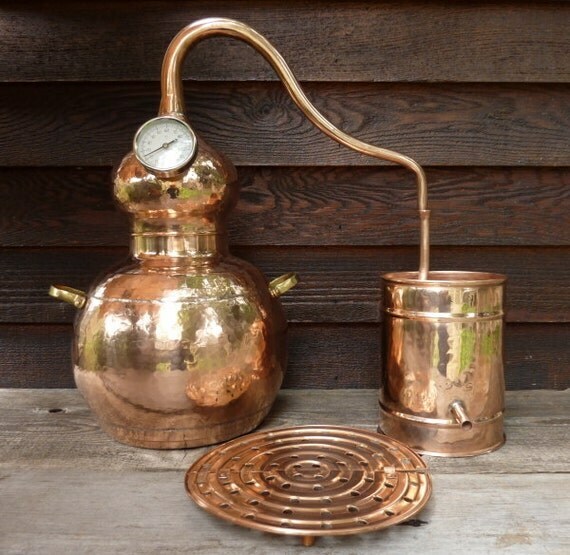 The practice of distillation originated independently in a number of regions. However, the method used by the Poles and Russians in the 1400s likely came from Italy. Italian alchemist Taddeo Alderotti of Florence recorded the process of distilling wine in 1276. He was also the first to describe a still that used a cooled coil or pipe to distill wine. Yet even the Italians were not the true originators of distillation. They learned it from trading with the Arab world. Distillation as practiced in modernity can directly trace its origins to Arab alchemists in the 10th century. Alchemists used an existing device called an alembic still to boil away wine to its essence or “spirit.” The resulting product became known as “spirited water” – a medicine of the era. While the idea of distilling wine was novel, the practice of distilling was common for alchemists of the Arab world. These scientists sought to understand and extract the core essence of the natural world. The process of distillation with an alembic still was most commonly practiced in the making of perfumes and herbal medicines. This process existed as far back as ancient Greece and possibly even ancient Babylon. Even the word alcohol is likely based on the Arabic “al-kohl,” which was a fine, dark powder used in cosmetics. The word’s meaning morphed to incorporate any refined or distilled substance as it passed into Europe. Today, much of our drinking lexicon traces its origins back to the Arab alchemists. “Spirits” refers to the alchemists’ attempts to find the essence of wine or other natural things. The “spirited water” distilled by alchemists appears in the name vodka, which is derived from the Russian voda, or water (in Polish the word is woda). Epistemologically, the “spirited water” idea permeates other culture’s alcohol naming as well. Whisk(e)y is likely derived from the Gaelic uisce beatha, the French brandy eau de vie, and the Scandinavian staple Akvavit comes from the Latin aqua vitae, both of which translate to water of life. So, the next time the bartender asks if you want Russian, Polish, Finnish, Swedish, or American vodka, remember—they all owe a debt to their real region of origin: the middle east, and mythical alchemy is alive and well in distilleries across the world. In a cocktail shaker, muddle the raspberries. Add the rest of the ingredients and a dash of orange bitters (if applicable). Add ice, shake and double strain into a glass. Paul Lewandowski is a graduate student, veteran and writer. He prefers a good gin gimlet to just about anything else. America is his favorite country and his favorite color is a tie among red, white, and blue.